He quit internationals in July 2012 as his country's fourth-highest Test wicket-taker - with 310 in 76 matches - and has focused on Twenty20 cricket in recent years. "It's been an amazing and emotional 20 years and I've enjoyed every single moment of it," said the 38-year-old. He will see out the remainder of the Big Bash League with the Sydney Sixers - which could mean his final game coming next Thursday against Sydney Thunder. "I'm excited and emotional, certainly happy that I've made the right decision," Lee added. "I didn't bother doing the maths but 20 years is a lot of ice baths, a lot of training sessions, a lot balls bowled and a lot of flights - but it's given me so many great memories." 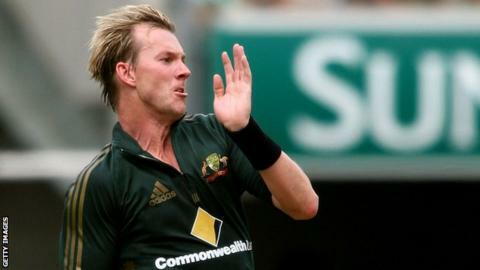 "He has been an exceptional cricketer who gained fans around the world, not only for his electrifying pace and performances with the ball, but [for] the way that he played the game," said Cricket Australia chief executive James Sutherland.